Louis Vuitton's S/S and Cruise 2013 Collection For Paper Dolls! Louis Vuitton is showing off their Spring/Summer and Cruise 2013 collection in a wonderful, fresh, rejuvenating paper doll format! This was a genius idea if I may say so myself and playing with magnetic paper dolls is so much fun for me and my 18 month old and that is just the Melissa and Doug version. 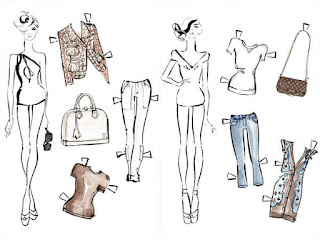 Could you imagine how much fun dressing paper dolls in LV could be?? A-MAYZE!! If this was a true paper doll collection I probably would have to get it! For the full collections view this link. And by the way, the LV collections are great! Peter Pan collars, chic capri pants, denim, signature LV bags, cafe, brown colors, blue and purples and some sharp prints.